For example it sterilises ingested food, acidifies it and hence activates a powerful protease called Pepsin and allows vitamin B12 to be extracted from foodstuffs. Additionally, several minerals such as iron, calcium and zinc rely on this acid for their utilisation in the body. Betaine is vital for the correct break down of proteins, calcium, B12 and iron. 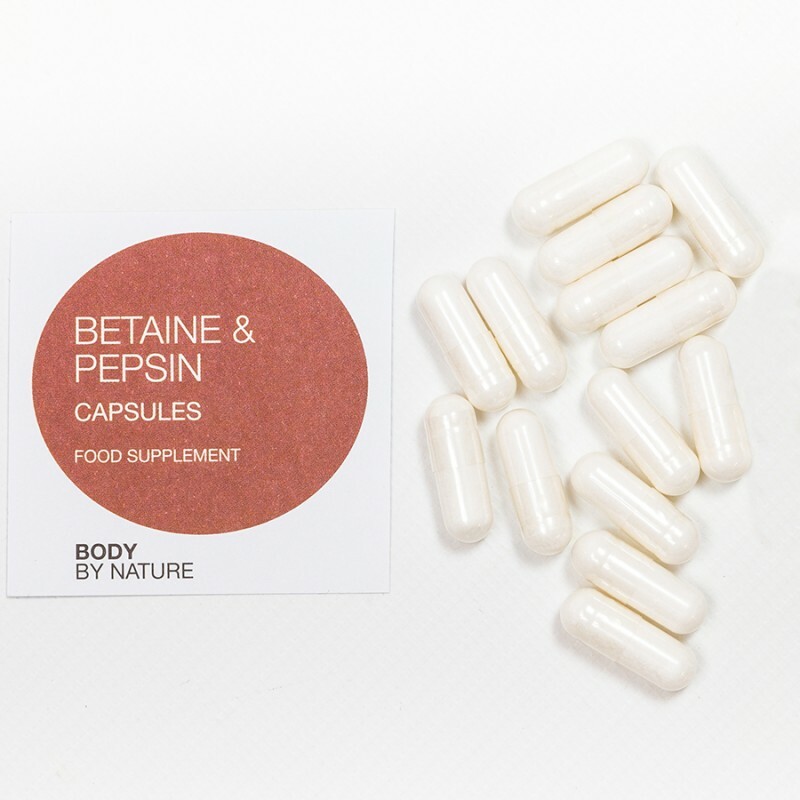 Betaine and Pepsin are naturally occurring gastric-juice components that deliver nutrients available for the body to absorb and provide support for biological activity. Pepsin benefits the body as it is a protein digesting enzyme.This supplement contains ingredients to support liver function - Betaine plays an essential role in the process. Betaine can have a positive effect on mood. Over time, our bodies produce less acids in our stomach to kill pathogenic bacteria and be effective in the digestion of enzymes. Betaine and Pepsin can help produce the acid it needs for normal function. Body By Natures Betaine and Pepsin supplement will assist to replace some of the acidity in the stomach which will ultimately aid the digestion of the food we eat. Easy-to-consume capsules – they are gluten free. This particular supplement is combined in a base of friendly probiotic species called lactobacillus bulgaricus which is a native inhabitant of the human tract. Betaine hydrochloride, capsule shell (gelatine), microcrystalline cellulose, pepsin. 1–2 capsules with main meals, or take as directed by a practitioner. Do not exceed the recommended daily intake. This product should not be used as a substitute for a varied diet. Do not take if you have a peptic ulcer. Do not break capsule before swallowing as content will damage tooth enamel. Wheat; yeast, starch, gluten; lactose; soy; added sugars, colourings, flavourings & preservatives.